I’m finally caught up with Naruto and not a moment too soon. Episode 175 closes not just Pain’s overwhelming story arc, but fulfils Uzumaki Naruto’s transcendence from annoying, mouthy kid to fully-fledged hero. Staggering back through the forest to Konoha after finishing with Pain, he looks like he’s about to slump to the floor, but just as he begins to falter, his old teacher, Kakashi, jumps in and catches him! Considering all that’s been inflicted on these two by now, this, on its own, is such a lovely and heart-warming scene, but there’s more to come. 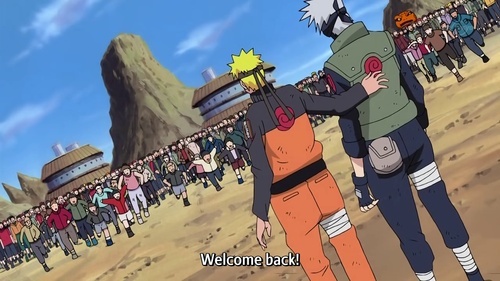 For, as they break into the clearing, Naruto finds the rest of the village waiting for him; cheering, clapping, laughing and chanting his name. 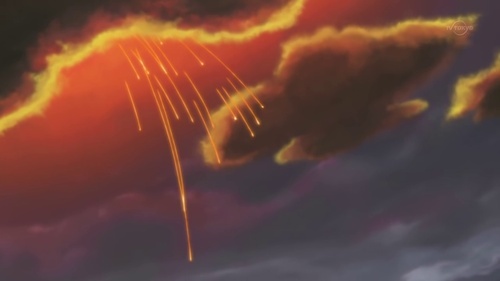 The Invasion of Pain Arc achieves a kind of grand, epic beauty. The sense of scale escalates beyond logic as Konoha is torn apart. Pain creates a giant ball of rock in the sky (much like the Moon!) 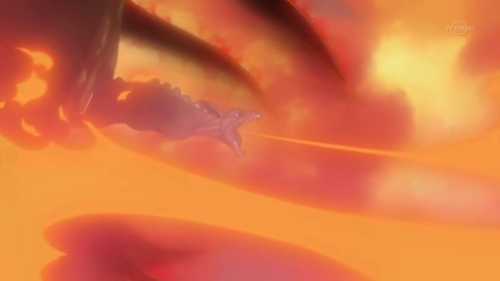 and traps inside of it an almost fully transformed Nine Tails, yet Naruto still bursts free, raining flames and burning rock down from above like an exploding asteroid. Scene like these are epic; that’s an over-used word these days, but there’s just no other way to describe the Earth-shattering stage on which their battle of wills plays out. For a battle of wills is precisely what it is. 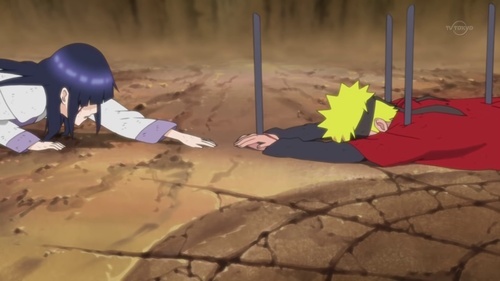 Both Pain and Naruto desire the same thing, peace! But their means of achieving it differs, and considering where he’s come from, Pain’s ideology is understandable. Born into a war-torn country where his family and friends were murdered right in front of him, he’s lost faith in mankind and wants to force peace through fear. To do this, he needs a weapon of mass destruction to strike fear into the hearts of all. Only then, in his opinion, is peace sustainable. This draws parallels with the USA’s detonation of the atom bomb in Japan, the sheer horror of which underlined what the whole world had to lose by continuing to practice total war. This ultimately influenced the Cold War, where an uneasy peace was established and people lived every day in fear of attack. Mutually assured destruction; that’s what Pain is gunning for. His own, frightful version of the Cold War. Debating his opinion, he asks Naruto in simple terms, “How would you go about creating peace, then?” but Naruto has no answer, and there is none. Is man governed by more than just his petty, short-sighted desires? Hinata intrudes at this point. 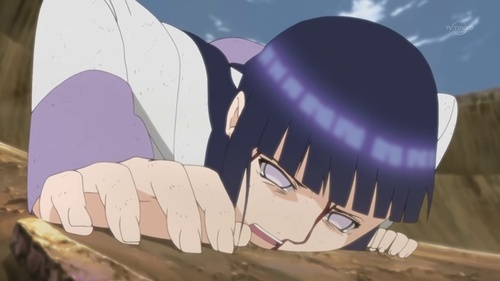 She wants to save Naruto and finally confesses her love to him, alas, she stands no chance against Pain and is heartlessly beaten to within an inch of her life. Forced to watch all this, Naruto loses his cool and once more the Nine Tails’ power surges forth, feeding on his desire for revenge. An eye for an eye, but that’s precisely the problem! Naruto has the power to obliterate Pain, but what then? 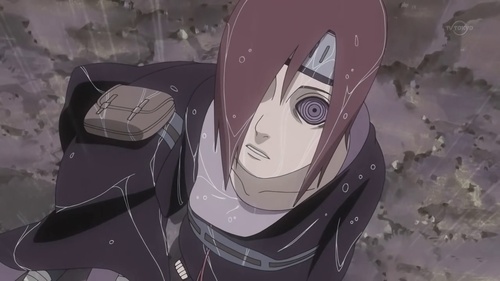 Would someone seek to avenge Pain too? It’s a never-ending cycle! Sooner or later, people have to put aside their desire for satisfaction and take responsibility. 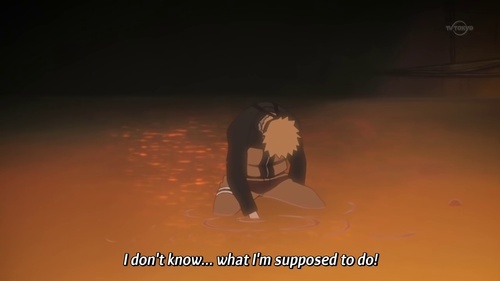 Of course, that’s easier said than done, but it’s what Naruto realises at the end of this story arc. He wins out because his optimism for the future melts Pain’s frozen heart. Naruto’s seen his home destroyed by this guy, his friends killed and maimed the man whose life he just spared; that’s what it means to take responsibility! He emerges from that forest a man! I am afraid that it all comes down to one thing: Jiraiya made a definite mistake when he helped those three kids back in the day.